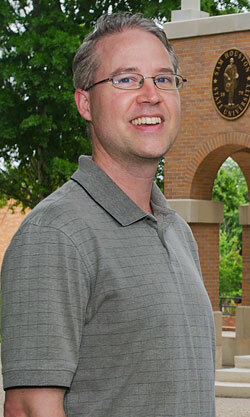 Todd Primm, associate professor of biology at Sam Houston State University, has been named one of 40 college biology educators nationwide to help reform how life sciences are taught in post-secondary institutions. The Partnership for Undergraduate Life Sciences Education program selected the individuals as Vision and Change Leadership Fellows to identify and consider ways to eliminate barriers to changes that are needed to improve undergraduate life sciences education. The PULSE program is a joint initiative of the National Science Foundation, Howard Hughes Medical Institute and the National Institutes of Health, all critical players in science research and educational funding. The effort is supporting a yearlong program in which Vision and Change Leadership Fellows consider and recommend models for improving the way life sciences is presented by educators and learned by students. “The PULSE project is very ambitions,” said Primm. “It seeks to reform teaching of life sciences at all institutions of higher learning in the United States. Undergraduate biology education needs to be transformed to match our current understanding of learning psychology and educational pedagogies. “We need to change our expectations of students learning by rote memorization to providing a learning environment based on active involvement with those things we are trying to teach them,” he said. Among the recommendations in the report were implementing changes to how biology is taught, how academic departments support faculty, and how curricular decisions are made. Research in education and classroom experiences have shown that lecturing to students in life sciences courses does not necessarily result in a desired learning outcome. The PULSE project promotes the introduction of scientific processes and research early in studies in interactive, inquiry-driven, collaborative and relevant student-centered classrooms. The program will work toward change by focusing on strategies that drive institutional change, with activities focused on academic departments rather than individual faculty members. Primm and the other post-secondary life sciences faculty members were competitively selected as fellows because of their experience in catalyzing reform in undergraduate biology education. After evaluating more than 250 applications, the PULSE steering committee selected the fellows, who come from 24 states and the U. S. Virgin Islands and represent research universities, liberal arts colleges, comprehensive/regional universities, and two-year colleges. Only three biology educators were selected from Texas, including Primm, Edwin Barea-Rodriguez, from the University of Texas at San Antonio, and Akif Uzman, from the University of Houston, Downtown. For more information about the Vision and Change initiative is available online.